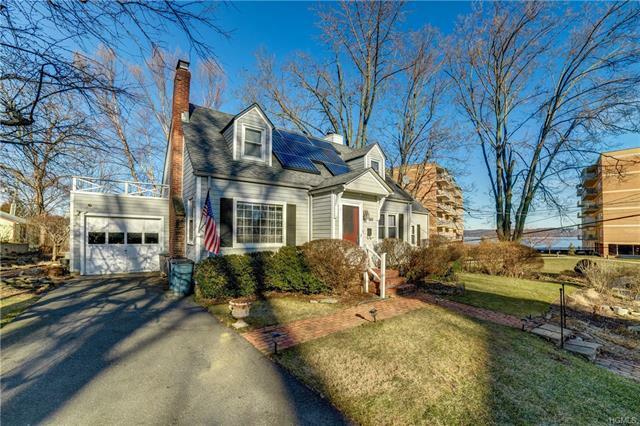 This quintessential river view Nyack village home, is located on a tree lined quiet street, steps from the Hudson River. The southern exposure bathes this home in pretty light, and the two wood burning fireplaces and hardwood floors help create a warm and cozy environment in approx. 2000 sf. The large and true eat in kitchen helps set the stage for seamless entertaining. The family room addition fondly called the "river room" is expansive and effortlessly integrates the outside space to the inside. There is some floor plan flexibility on the 2nd floor for the bedroom configuration. Central air and solar panels and 3 heat zones help keep this home energy efficient. The corner lot features native, mature trees and plantings. , The garage is a great bonus and not typically found in village homes. First time on the market, Upper Nyack Elementary, and only one block from the Nyack Boat Club.